Part 1 of the review covered features and functions, construction details and routing, storage and draft 802.11ac wireless performance. In this second and final part, we'll take a look at overall wireless performance as well as the details of two and three stream measurements. This product has been retested with the Rev 7 wireless test process. See this article for the results. The EA6500 is Wi-Fi Certified and defaults to Auto channel selection and the same SSID (Cisco + last 5 Serial # digits) on both radios. The 2.4 GHz radio is set to Auto Channel width and the 5 GHz radio comes ready to rock for draft 802.11ac with a 80 MHz channel width setting. WiFi Protected Setup (WPS) comes enabled and prompted me to enter the router's PIN and a new SSID, which it applied to both radios along with a self-generated sufficiently-strong password to complete a WPA2/AES secured connection. I had to change the SSIDs to unique values so that I could tell the bands apart. I ran 40 MHz Coexistence and Fat channel intolerant tests to see if the EA6500 properly refrained from switching into 40 MHz bandwidth mode. The router properly stayed in 20 MHz bandwidth mode when the client had its Fat Channel Intolerant bit set. But when I deliberately parked a neighboring wireless network on an interfering channel for the 40 MHz Coexistence test, the EA6500 continued to run in 40 MHz bandwidth mode, even after five minutes. 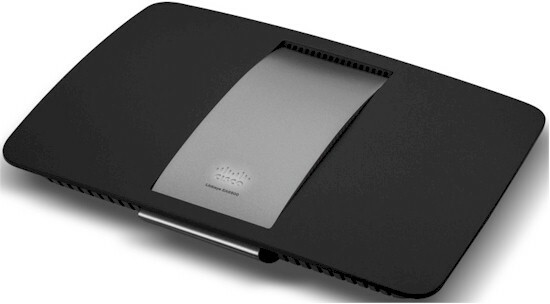 As noted in Part 1, draft 11ac measurements were made with the 5 GHz radio set to 80 MHz Channel width mode using a Cisco Linksys WUMC710 Wireless-AC Universal Media Connector bridge with 1.0.00 firmware as the test client. For two stream N tests I used our standard Intel Centrino Advanced-N 6200 in a Acer Aspire 1810T notebook running Win 7 Home Premium SP1 (64 bit). Finally for three-stream N tests I used our other standard client, an Intel Centrino Ultimate-N 6300 in a Lenovo X220i notebook running Win 7 Home Premium SP1 (64 bit). 1.1.27.142736 firmware was loaded for all testing. As is our standard practice, all tests were run using WPA2/AES encrypted connections with Channel 1 used for 2.4 GHz tests and Channel 36 for 5 GHz. Each entry in the Benchmark Summary below shows the average of throughput measurements made in all test locations. Table 1 summarizes the highest wireless throughput measured out of all locations in the 20 MHz mode test runs. In all cases, highest throughput was measured in Location A. Note that the Dn/Up result is for simultaneous up and downlink tests in Location A. Switching to 40 MHz mode, however, unleashed the real beast in the EA6500. Just take a look at the Uplink column in Table 2 below. The two stream results put the EA6500 at the top of both the 2.4 and 5 GHz charts with measurements of 164 and 160 Mbps, respectively. The highest throughput I measured was 202 Mbps for three-stream uplink in 2.4 GHz. But this wasn't enough to surpass the WD My Net N900 or ASUS RT-AC66U, which measured 217 and 231 Mbps, respectively. Table 3 summarizes the draft 11ac mode best case throughputs. The 382 Mbps running uplink beat the ASUS RT-AC66U's 361 Mbps, with a comfortable margin.